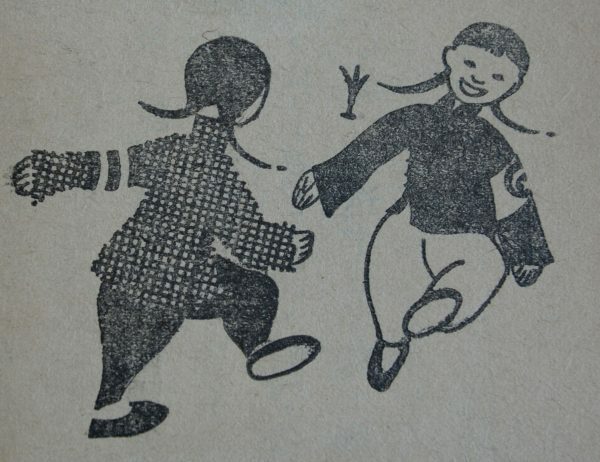 Unattributed and untitled image of two Chinese children (one wearing an armband with the Daminhui logo in it) from a 1940 Daminhui propaganda publication. 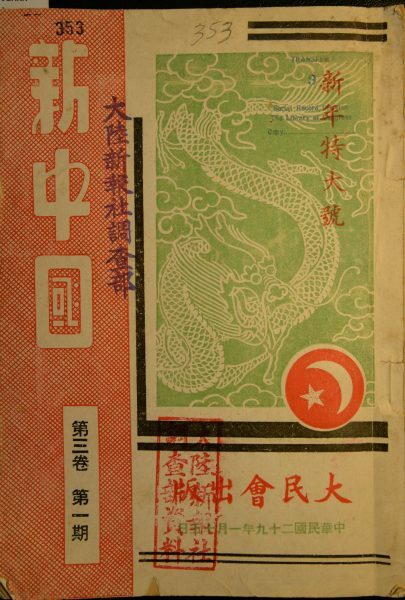 The Daminhui (lit., “Great People’s Association”) was organised by the Japanese special service in Shanghai in 1938, but was officially directed by the veteran Kuomintang member Wen Zongyao in Japanese-occupied east and central China. It has been described as the “flagship enterprise of the Reformed Government [of the ROC].” The Daminhui was responsible for a variety of propaganda work, and learnt its skills directly from propaganda organisations in north China, especially the Xinminhui. 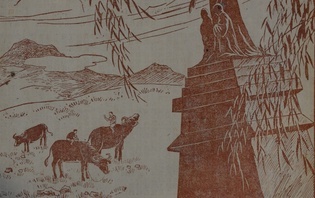 Within the Daminhui’s Propaganda Department worked Chinese graphic artists, journalists, dramatists, and activists. The Daminhui made a particular name for itself in mobilizing local communities for pro-occupation celebrations. Much of the propaganda work undertaken by the Daminhui (and reproduced in its house pictorials like New China) looked remarkably similar to the “salvationist” (jiuguo) propaganda that had been developed by the Chinese resistance in Wuhan in 1938. This was because a number of the Daminhui’s affiliated agencies were specifically designed to emulate what the Japanese saw as effective methods of persuasion developed by the Chinese resistance early in the war. Nonetheless, the Daminhui developed its own “brand.” It operated under a logo comprised of a five-pointed star and a crescent moon. The influence of the Daminhui would continue to be felt in occupied east China through until 1945, as many of its members joined the ranks of Wang Jingwei’s government at its formation in 1940. 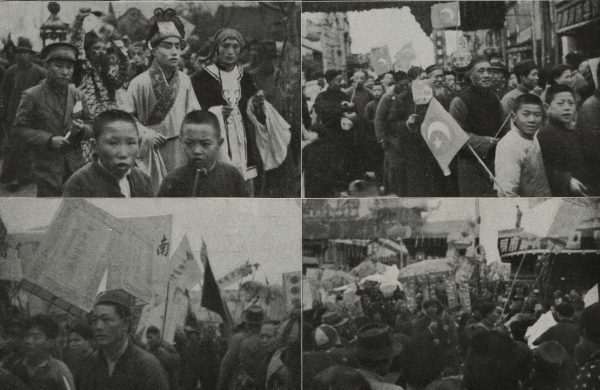 Revellers at the founding of Wang Jingwei’s Reorganised National Government in March 1940 wave the Daminhui flag. T’ien-wei Wu, “Contending political forces during the War of Resistance,” in China’s Bitter Victory: The War with Japan, 1937-1945, eds., James C. Hsiung and Steven I. Levine (Armonk, NY: East Gate, 1992) , 66–67. Wen Zongyao, “Daminhui Wen huizhang gao minzhong shu” [Letter from Director Wen of the Daminhui to the people], Xin Zhongguo 2, no. 11–12 (December 1939): 2–3. Timothy Brook, “Occupation state building,” in China at War: Regions of China, 1937–1945, eds. Stephen R. MacKinnon, Diana Lary and Ezra F. Vogel (Stanford, CA: Stanford University Press, 2007), 35. Liu Jie, “Kangzhan chuqi Huadong lunxianqu qin-Ri qunti yanjiu: yi Daminhui Zhenjiang lianhe zhibu wei zhongxin de tantao” [A study of pro-Japanese groups in occupied areas of east China in the early stages of the War of Resistance: A discussion of the Daminhui’s branch office in Zhenjiang], Zhongyang yanjiuyuan jindaishi yanjiusuo jikan 98 (2017): 89–114. As detailed in Stephen R. MacKinnon, War, Refugees, and the Making of Modern China: Wuhan, 1938 (Berkeley, CA: University of California Press, 2008).